The Digison range of intelligent ultrasonic sensors manufactured by Smart Storm range from high accuracy, high resolution devices for precision flow measurement, to robust high power devices for liquid and solid level measurement. 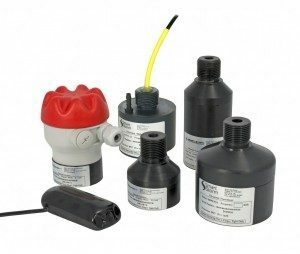 Manufactured in HDPE or PTFE, the sensors are resistant to most chemicals and hostile environments. Intelligence: All Digison sensors contain powerful Field Programmable Gate Array (FPGA) processors which are renowned for robust performance and excellent durability. Unique to the Digison range of sensors is the ability to return a real time ultrasonic echo direct to the USI controller for viewing and setup. High Resolution and data speed: The Digison 3 & 6 offer resolution of less than a millimetre and data capture of less than 1 second which means for flow applications both instantaneous flow rate and daily totalised flow are truly representative and highly accurate. Narrow Beam Angle: All Digison sensors generate a beam angle of only 6 degrees meaning narrow vessels and apertures can be used meaning the risk of false echoes from tank walls, seams and welds and other interfering objects such as internal ladders are reduced. Integral Temperature compensation: All Digison 3 have integral temperature compensation to allow for ultrasonic time of flight variations due to temperature (~0.7% per degree centigrade). Changes in time of flight are automatically compensated for in the sensor electronics so the distance measured is always the true distance. The Digison 3 is available with a reflective plate which enables even higher accuracy for flow measurement. Fittings: The transducers are available in 1” NPT thread or blind flanged in ANSI or DIN patterns. Submersion hood, angled brackets and aiming kits are also available. Maximum Cable length: Cable length can be up to a maximum of 500m from the instrument. Standard Thread: 1” BSP (other threads available on request).